A named pipe is a system kernel object that processes on the same server may use for communicating with each other. It is a fast, secure, and reliable way for your applications to access on-machine WCF services. 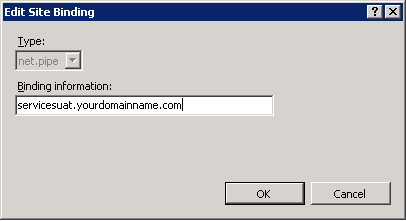 While working on the test server that hosted multiple sites in IIS7 (test, uat, staging, etc. ), I have noticed that for a single web service all sites used the same named pipe - you can look at all named pipes defined on your system using a tool like PipeList. Needless to say, reusing the same named pipe is not a desirable behavior in this situation. I looked closer into the issue. From what I now understand, WCF uses an algorithm that maps a service path to the pipe name. By default, this algorithm ignores the domain name of the site and, thus, all sites on the server map services with the same local path to the same named pipes. That explain the root cause of the issue. How can we get it fixed? How can we force the algorithm to take the domain name into acount when creating a named pipe? Hope it helps. Happy coding! 0x80040154: Retrieving the COM class factory failed. It turned out that FDF Toolkit 6 has been compiled only for a 32-bit OS. Thus, in order to make it work with IIS 7, you will need to register FDF Toolkit using the 32-bit version of regsvr32.exe. You will also need to enable 32-bit applications in your application pool.